Background The Ryukin breed of goldfish came into existence through mutation of the long-finned Wakin. It was brought to Satsuma (Kagoshima Prefecture) from China between 1772 and 1788 through Ryukyu (Okinawa Prefecture). 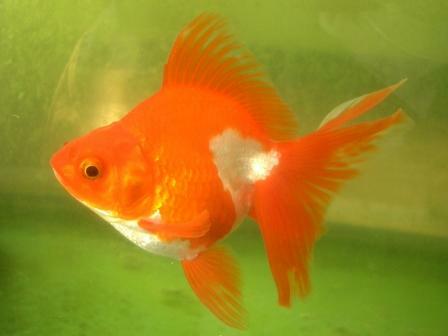 Since this goldfish was introduced through the Ryukyu area, it is named Ryukin. Features The Ryukin have a long, thick and round body. Each fin extends and a characteristic of the tail fin in particular is that it can become longer. The basic body color is red-and-white or red. White Ryukins are subject to sort. The way the Ryukin swims with its long tail flowing is elegant. The Ryukin is the most well-known goldfish and is often called the most typical kind of goldfish. Acquisition difficulties Easy. They can be found anywhere, and are as easily accessible as the Wakin. However, it is rare to find the Great Ryukin. The Great Ryukin means they have a short, pointed head, a round, thick body and their body is bright in colour. The Great Ryukin is often very expensive. Rearing difficulties Easy. They are the strongest type of goldfish following the Wakin type. However, when the Ryukin has curved lateral lines or its tail is on the extreme upper side of its body, they tend to die through subversion. Details of the above photo The beautiful goldfish in the photo has characteristics of the Ryukin. It's difficult to say it’s an excellent goldfish, but can be enjoyed for its aesthetic value. Other The "Edogawa Ryukin" in Tokyo is the most famous variety of Ryukin. Among all Ryukins, the Ryukin produced at Horiguchi Fish Farm are called "Horiguchi Ryukin", and are considered to be a brand. Recently, Kimura Fish Farm in Saitama Prefecture is also becoming famous for producing Ryukin as great as the Horiguchi Ryukin.